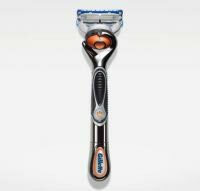 This is the same razor as the Gillette Fusion Proglide Manual Razor, except this has a battery in it and vibrates when you push the button. Regardless of this "technology" if you can call it that, this razor, like all other 3, 4, or 5 blade razors I have tried before, is far more irritating and does not give as close of a shave as the simple 2 blade Gillette Trac II, which is still by far the least irritating razor I have tried (with the 2 blade Gillette Sensor Excel a close second). The FlexBall really doesn't do anything to help "hug the skin." Save your money and get a much better shave with less irritation with the Trac II.